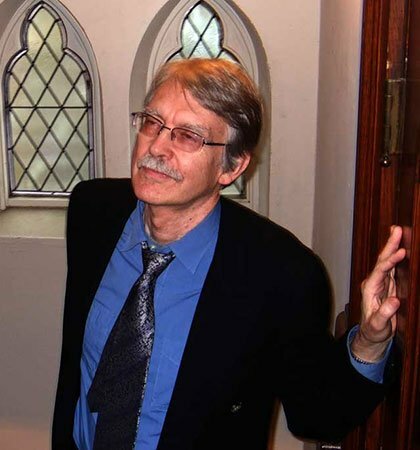 John Harbison turns 75 this month, and his colleagues and friends are giving him quite a bash. A lot of musical worthies of the classical and jazz persuasions will be on hand, including some surprise guests. John will variously lead, play and listen to music representative of his varied oeuvres as composer and conductor, including: Harbison’s Cortège for percussion ensemble; premieres of some of his jazz songs with lyrics by MIT students and a piece for violin and jazz trio; J. S. Bach’s Cantata BWV 118, performed by MIT Chamber Chorus and members of the MIT Wind Ensemble conducted by Harbison; performances by MIT Vocal Jazz Ensemble, and MIT’s faculty jazz quintet, Strength in Numbers: John Harbison, piano; Keala Kaumeheiwa, bass; Fred Harris, drums; Dylan Sherry, tenor saxophone; Mark Harvey, trumpet; and special guest Rose Mary Harbison, violin. It’s all free on Sunday at Kresge Auditorium at 7:00. An appreciation of the man and his work appears after the break. After that, the complete program. At 75 Harbison is still a young composer, one whose musical ideas are ever fresh and varied. He has composed substantial works in every genre. His music has been performed all over the world, but he makes his home here in Cambridge, where he has lived most of the time ever since college. As a teacher, he has influenced two generations of young musicians at MIT, Boston University, and a dozen other institutions, and lent his support to dozens of early careers. As a conductor, he has tirelessly promoted not only a wide variety of new music by others, but also a rich and ongoing series through Emmanuel Music and Cantata Singers of Bach and his contemporaries, introducing many works seldom or never heard here before. During summers, John Harbison and his violinist wife Rose Mary—they have been married for fifty years this year—retire to a music festival in Wisconsin that they founded together and for which they are among the principal performers; John plays piano accompaniments and sometimes viola, and also jazz, which he started playing back in Princeton High School in the early 1950s. BMInt staffer Mark DeVoto remembers seeing him playing a valve trombone in a jazz combo at Harvard; he admitted that once he had performed Serge Koussevitzky’s unique Concerto for Double Bass and Orchestra, but playing the solo part on a tuba. That may be just a funny story, but it illustrates a small corner of the versatility of John Harbison, comprehensive musician, who has given so much of himself to us and to the world in 75 years. John’s achievement as a composer has been honored with a Pulitzer Prize and a MacArthur Foundation grant, but above all by the abundance of performances and recordings of significant works, including symphonies and other orchestral pieces right here in Boston. He memorably conducted the Boston Symphony in his Symphony No. 1 after Seiji Ozawa had bowed out, and over the years under other conductors, perhaps most notably James Levine, the BSO has given performances of Harbison works like Diotima (after Plato and Hölderlin) and Darkbloom (after Nabokov) and more recently the cycle of five symphonies and a new Double Concerto. Last spring, in Jordan Hall, a concert performance of The Great Gatsby, a Metropolitan Opera commission in 1999, was a thrilling occasion. One hardly knows where to start in listing and describing the chamber music and especially the vocal music, especially because of John’s special sensitivity to texts (it’s hardly surprising that as an undergraduate he occasionally wrote verse as well as music). And it’s a relief to observe that John does not to be slowing down. Let’s hope that we can say that for many more years. John Harbison is definitely not retiring. His friends and colleagues won’t let him, nor will his muse.